Over the past 10 years, The Study Academy has become one of Canada’s finest schools offering places to international students. We have welcomed students from China, Israel, various African nations, France, and countries within South America, and all of our students have flourished under our faculty. 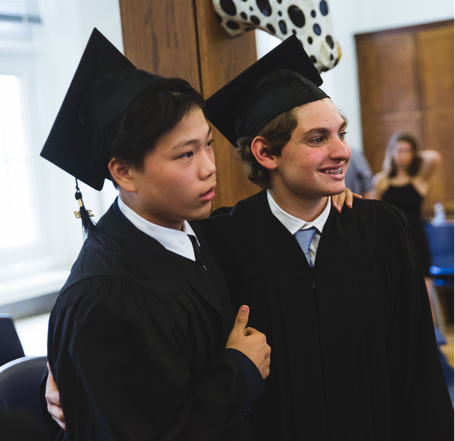 In addition to being immersed in an English-speaking community, all of our students have earned their Ontario Secondary School Diploma (OSSD) and have gone on to succeed in their chosen post-secondary programs. Applying to The Study Academy is as easy as counting to four. Check out our four-step process, and get in touch with us should you have any questions. Come and learn about our school’s community, philosophies, and practices. Contact our school or speak to your agent directly to have your questions answered. Submit an International Student Application Form along with the application fee and the requested supplementary documentation to admissions@thestudyacademy.ca. Upon receiving a complete application, we will schedule a Google Hangouts or WeChat video interview call with the applicant. The applicant will also be scheduled for an English language and mathematics placement assessment at a specified location near his/her own home. Please note that early acceptance will be available for students who have completed their application and online interview prior to the Early Acceptance Deadline. All applicants will be considered equivalent prior to the Equal Consideration Deadline. If spaces remain available past the Equal Consideration Deadline, applicants will be considered based on their date of application. For all International Fees and Tuition Fees please see our Admissions page.